JOHANNESBURG, Mar 8 2019 (IPS) – Africa is facing dire times. Climate change is having major impacts on the region and on agriculture in particular, with smallholder farmers, and especially women, facing drought, general lack of water, shifting seasons, and floods in some areas. Small holder women farmers are at the cold face of agricultural biodiversity erosion, deforestation, declining soil health and fertility, land and water grabs by the powerful, and loss of land access, marginalisation and loss of indigenous knowledge, and generalised lack of essential services and support. At the same time, economies are weakening and remain heavily dependent on foreign aid, with extractivist interventions from outside. There is a strong authoritarian orientation in governments in the region, with secrecy and lack of transparency and accountability, weak and fragmented civil society organisation, and top-down development interventions. There has been corporate capture of key state institutions, decision making processes and functions, with privatisation of decision making and exclusion of the populace, and the occupation and appropriation of seed and food systems for multinational corporate profit. At present, corporate power is almost unchecked in agricultural input supply. The dominant narrative of agribusinesses being indispensable for feeding the world holds great sway on the continent, and where corporations have captured policy making processes from continental to national levels. Although most seed on the continent is sourced from farmers’ own saving, sharing and local markets, this system is not recognised in policies and laws in most countries. Farmer seed practices are marginalised and generally denigrated as poor quality and backward. The predominant thrust of agricultural and seed policy and programming on the continent is to seek to replace farmer systems with top-down interventions based on the use of privately-owned technologies, as well as large-scale commercial markets that can only ever integrate a relatively small top layer of producers if not displace them outright. This thrust is driven by multinational corporate interests with support from key continental, regional and national state institutions and agencies. This is either from a large-scale commercial industrialisation thrust pushed by a powerful global agribusiness coalition, or through a Green Revolution smallholder strategy to integrate a layer of smallholder farmers into corporate value chains for the export of bulk commodity crops such as maize and soya. Women play an essential role in the selection, saving, and sharing of seeds, as part of a broader network within farmer managed seed systems, shaping the agricultural diversity that meets needs of local populations. This applies to both staple crops, as well as other food crops. In many ways, this pool of genetic resources, which women continue to develop and maintain, is the backbone of human society. The restrictions placed over reproductive materials, i.e. seed (including all cultivation materials), and the centralised decision-making around reproduction towards uniformity, homogeneity, ownership, creates greater inequality, amplified vulnerability and a reliance on external inputs, which places the future of food production at greater risk. Increasing restrictions on use, lack of support for these activities and even their criminalisation makes production conditions more challenging for all smallholder farmers, but particularly women as the majority. In the prevailing division of labour, women are generally responsible for food acquisition and diets. Picture courtesy of Linzi Lewis. 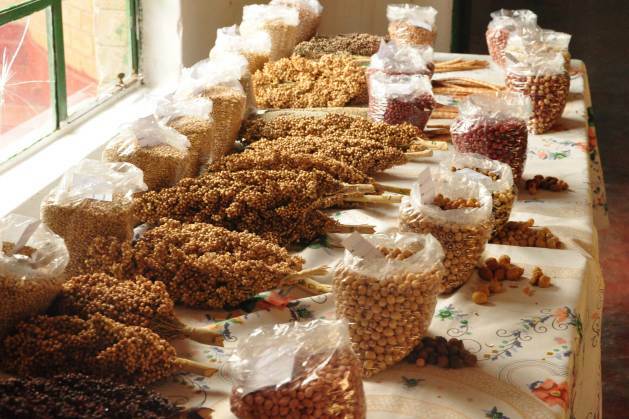 Restrictions on seed use, what may and may not be produced and how, translate into limits on food diversity at household level, which is a key element of nutrition. Since the majority of seed cultivated on the continent is saved on farms, exchanged and locally traded by farmers, this provides a solid base for alternative seed sovereignty systems to thrive outside the credit and corporate market. For small holder farmers in Africa, the importance of farmer seed systems as central to conserving biodiversity, ensuring nutrition diversity and supporting livelihoods has been highlighted in a huge body of work over the past 30 or 40 years. However, these systems can benefit from external support. A key priority for smallholder farmers in Africa is resilience in the face of harsh weather events. This requires seed variety adaptation and greater agricultural diversity. Women are the primary custodians of our seed diversity, the custodians of reproduction, of life. This highlights the struggles of farmers’ right, of reproductive rights, to self-determination, and to maintain life-supporting systems. As we honour women on this day, we honour our heritage and our future. An ecological food systems transition coalition, based on agroecology and food sovereignty, has found some traction in Africa and globally, but remains relatively weak, fragmented and under-resourced. Farmers, especially women, and civil society are doing important work on agroecology and sustainable agriculture on the ground, but are often unable to break out of their localised practices. These need to urgently connect with others on the continent into a bigger and more coherent movement for change, especially radical feminist movements on the continent. Together, we can fight back and contest the hegemony of large-scale commercial farming and corporate agri-business. We must, together, rebuild and strengthen local food and seed systems for all Africans.